So how did we get here? How did we get from last week’s story from Joseph’s life, to this story commonly known as the Exodus. You’ll probably notice me ask that question often, as we sail through the great stories of the Bible this Fall, skipping a few along the way. How did we get here? Well, for those of you who are following the daily readings printed in the bulletin insert, you know exactly how we got here but for those of you who haven’t, shame on you! Kidding! I’m kidding! I do highly recommend them though, and there is also a daily devotional to go along with those readings that you can find at the website listed in the insert. But I think if you read them you will get an even better picture of how all of these stories are going to eventually lead us to Jesus’ story. Last week we had the story of Joseph being thrown into prison after being accused of sexual assault. Funny how timely these old stories can be right? In spite of being in prison Joseph still finds success there and is given charge of the whole prison. Eventually he catches the ear of the Pharaoh, the king himself. And in a scenario that was made for movies, he ends up becoming the ruler over all of Egypt, second only to the king! If you aren’t familiar with this story, or haven’t read it in a while, I highly recommend you do. It’s the last 14 chapters of Genesis and it’s just one of the greatest dramas in all of scripture! So, long story short, Joseph is ruling over Egypt when a famine hits the entire region. In fact, his leadership is what saves them from starvation. He reunites with his brothers, yes those brothers, the ones that threw him down that dry well and then sold him into slavery, and invites his whole family to join him in Egypt to weather the rest of the famine. However, his family ends up staying there. Well, his family didn’t just stay there, they grew! Remember that promise that God gave to Abraham two weeks ago? “I will make of you a great nation.” Well, God wasn’t ly’n! They grew…like rabbits! They grew so big, that they became a threat to the nation of Egypt, who wondered how they could keep them under “control.” What once was a blessing to Egypt in the form of Joseph, was now thought to be a curse. And so, Egypt devised a plan to deal with the Jewish question. Slavery. Slavery was how they were going to keep them under control. Slavery was how they would keep them from rising up against them. Well, that plan backfired. There’s only so much a people can take before they resist, or fight back, or run away. And that’s exactly what they did. They ran. After much arguing and fighting, Egypt’s king finally gives up and lets them go. And under Moses’ leadership, with God at his side, they run, fast and hard, to freedom’s waters. And that’s exactly what they try to do. They argue with Moses saying, “This is what you brought us out here for? To die? Isn’t slavery better than death?” It’s a very human reaction. Don’t judge them to harshly. Judging them is tantamount to judging the mirror. We humans have a tendency to react very pragmatically, very logically. We tell ourselves, if something doesn’t make sense then there must be a reason, and that reason probably spells doom! It’s simply a survival instinct. And it’s a hard instinct to fight. But that’s exactly what Moses tells them to do. Fight that instinct. Our brains tell us to choose fight or flight. And God tells Moses, there’s a third option. An option that only God is privy to but it’s there nevertheless! This is not the end. This is not your end. And all they have to do, is shut up and sit still. Well, easier said than done God! Have you ever been backed into a corner, those times in your life when you feel stuck between a rock and a hard place? I don’t know about you but I either come out swinging, or recoil into my turtle shell to wait out the danger. But standing my ground? Being still and waiting for an option that I can’t even fathom to come to light and save me? Mmm, no thanks. That sounds like ridiculousness. And then I’m reminded of these old stories, handed down to us by our Jewish siblings, to learn these hard lessons that they endured—to shut up, and be still—because this is not the end, this is not your end. This story became a pivotal story for our Jewish siblings. With the foundation of that promise given to Abraham, this story became what defined them as not only a people, but defined their relationship with their God. As we will see in the coming weeks, they will have to endure much strife, nothing will come easy for them. And if they thought this Egyptian king was bad news, they hadn’t seen nothing yet. That is why, returning to this story, every year at Passover, and especially in the midst of each struggle, was so important to their survival—remembering, this is not the end, this is not our end. Oddly enough, this story was just as important to American slaves. And I say odd because they clung to their master’s religion. You would think, that any religion that a cruel slaveholder followed, must be just as cruel. But somehow, they saw something in their Christian religion, and this story in particular, that their white American slavers clearly did not—hope. We are going to sing two slave songs today. The first one is O, Mary Don’t You Weep. The song draws from two different Bible stories, the Exodus and the raising of Lazarus. Lazarus was the brother of Mary and Martha, and in the Gospel of John, he died and Jesus went to go visit them. Mary weeps, and Jesus tells her that Lazarus will rise, that this is not the end, this is not his end. She thinks that Jesus is talking about the afterlife, because that would be the logical conclusion right? No, Jesus shows her another option, and raises Lazarus back to life. We sing this song at the Vigil of Easter, when we return to these old stories, as a reminder that new life and hope have been happening since the beginning of time, and can come out of nowhere. The other slave song we will sing, is Wade in the Water. This song too was sung by slaves, and this one had a secret code in it. 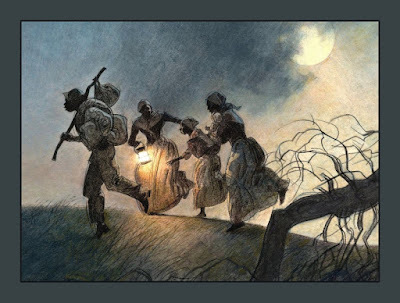 Harriet Tubman used this song to teach escaping slaves to travel off the paths, and wade through streams and rivers, so that their scent would be hidden from the dogs that their slave masters would sic after them. This song too uses imagery from both Hebrew and Christian scriptures. Troubling the waters comes from the story of a healing pool from the Gospel of John. The sick would wait for the waters to move, to be troubled, and that would signal that an angel was flying over waiting to heal someone. Though quite mystical in nature, the story was filled with the hope of another way, an option to life that may not be obvious, hope that this was not the end, this was not their end. I don’t think any of us here can really understand what slavery is like, but I imagine that hopelessness and despair are around every corner. And that I know that many of us in this room can relate to that, at some point in our lives. And if you can’t, I’m guessing you know someone who can. These stories, these songs, are ways that humans, over the centuries, in the midst of the worst of times, have held on to hope, have clung on to hope by the whites of the knuckles. These stories and songs, have communicated to people—this is not the end, this is not your end. As dire as your circumstances my seem, as hopeless as that rock and hard place may feel, as evil as the world around us looks, please remember this—because of God’s promise, because of God’s presence, because of God’s power—repeat after me, this is not the end…this is not our end…thanks be to God…Amen.